Crispy Buffalo Wings baked in oven. Very crispy thanks to a secret ingredient. You’ll no longer want to fry them. Serve them coated with a luscious hot sauce and lick your fingers! Updated on 1/30/2017 with a video. Different from the previous recipe, I added curry powder in the recipe to give the wings a nice flavor. You can see the hot&sweet sauce I made for this recipe there. Plus, you’ll witness how we enjoyed these scrumptious buffalo wings at the end of it. I couldn’t count how many I ate! 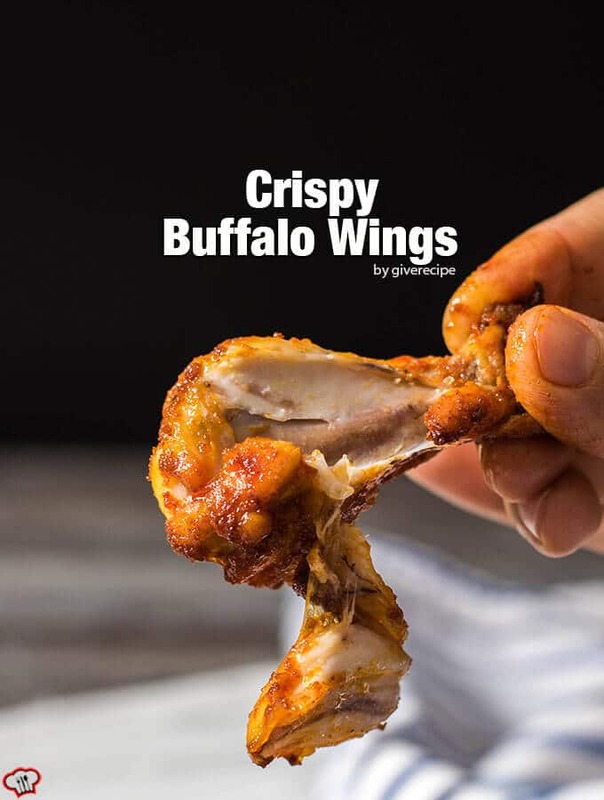 Crispy Buffalo Wings can definitely be made in oven. I’ve made these in oven and they are as good as deep-fried wings. You will be amazed when you see that these are wonderfully crispy on the outside and juicy on the inside. The recipe is pretty simple. You will be successful even if you have little experience of cooking or no experience at all. I have the same crispy and juicy result every time I make these and they are life saver when you have guests for dinner or for a game party. These crispy buffalo wings have a secret ingredient that makes them that perfect. Did I tell you how simple the ingredients are? Don’t worry for that secret ingredient that makes the magic, I’m sure you always have it in your kitchen. Ok, I’m talking about baking powder. Have you ever used it for something different from cake or pie kind of thing? I sometimes really love the chemistry behind cooking. It simply helps the wings to get crispy. You can even watch it when they are in oven, you’ll see how their skin rises and sizzles, which results in a crispy surface. Noone realizes the baking powder addition on these wings, it doesn’t taste at all. These incredible buffalo wings are flavored with garlic and chili. Sounds flavorsome, doesn’t it? After seeing that it’s possible to make crispy buffalo wings in oven, you’ll no longer want to fry them. No mess in the kitchen. Something we all want, right? I’ll be honest. I don’t use fork or knife when eating these crispy buffalo wings. I use my hands and yes lick my fingers after cleaning the bone perfectly. Isn’t it the fun part of eating wings? Crispy buffalo wings in oven. 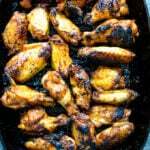 Place chicken wings on the baking sheet and bake for 30 minutes. After this time, remove them from oven, turn them over and bake for another 10 minutes. Optional serving: You can prepare a sauce mixing 1/2 cup chili sauce, 1/4 cup soy sauce and 1 tablespoon honey. Toss in the oven baked wings. Hi Jess! As it’s included in the notes section, you can make the sauce by mixing 1/2 cup chili sauce, 1/4 cup soy sauce and 1 tablespoon honey. Toss in the oven baked wings.